We used to drive three cities away to San Clemente to get carnitas at La Siesta. Their carnitas are seriously good, and the restaurant itself is quite cool. No outside seating, but inside it’s like a Baja beach shack with margaritas. We fell a little out of love with it when Carmen, our favorite waitress—seriously, she was the best waitress in the world—was fired because the other girls were jealous that every customer wanted to sit in her section if she was working. It’s all fitting (barely) in the pan. So, that dimmed our love a little bit, but we still used to go down there when The Husband needed his carnitas fix. 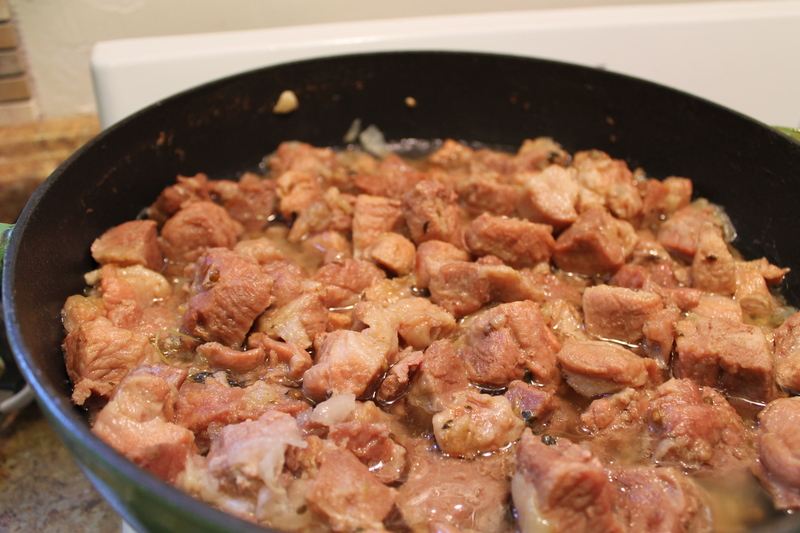 But when I finally decided to make my own carnitas, I think he’s decided he never needs to go there again. 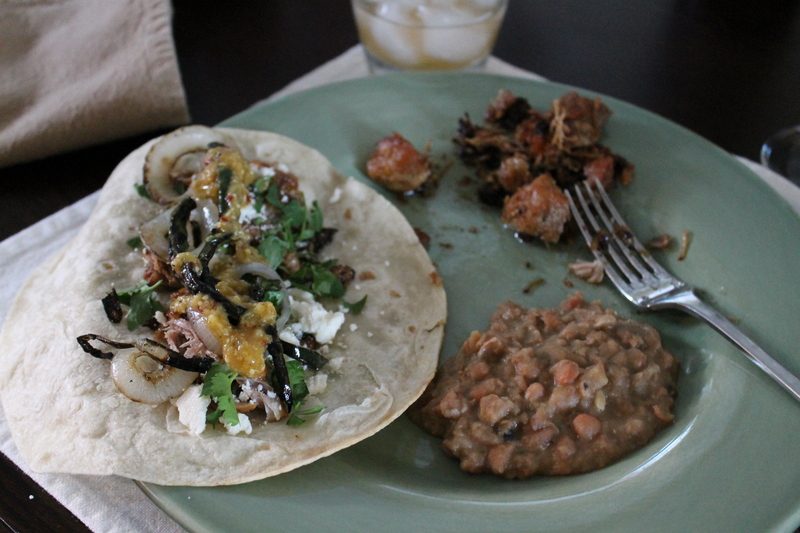 Let’s face it, the margaritas, and now the carnitas, are better at our house. And with a lot less travel. Rendering, rendering. The house smelled wonderful. Spoken like a true loving father, for sure. So I decided to finally take on the carnitas challenge. I looked through about 20 recipes, some with ingredients like beer, Coca-Cola, milk, orange juice and so on, and finally decided on this one from Chow.com. I changed it up a little bit, but not much, mainly just adding some thyme and more garlic. Oh, and some fresh cilantro as well as the coriander seed. And I made a sauce, which I’ll add here after the carnitas recipe. And by the way, this is a Saturday or Sunday afternoon dish. You do not whip this up on a weeknight after work. This seriously needs to simmer and cook for hours. 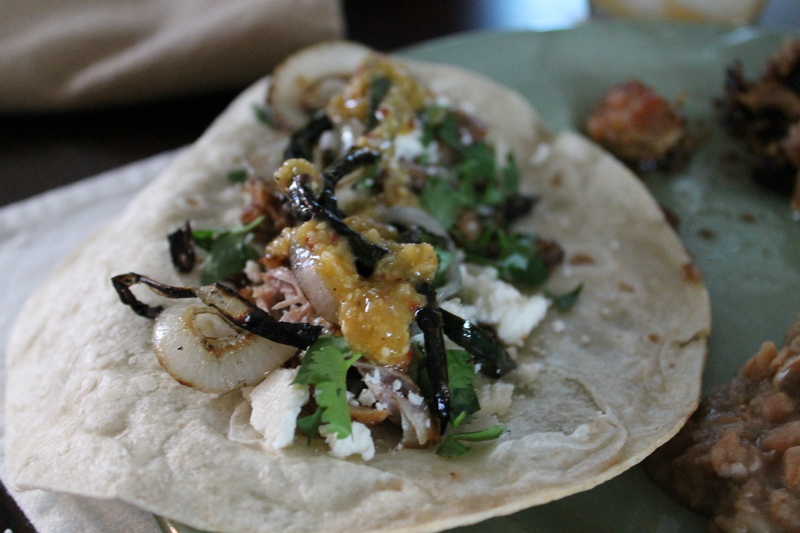 You cannot rush the carnitas. 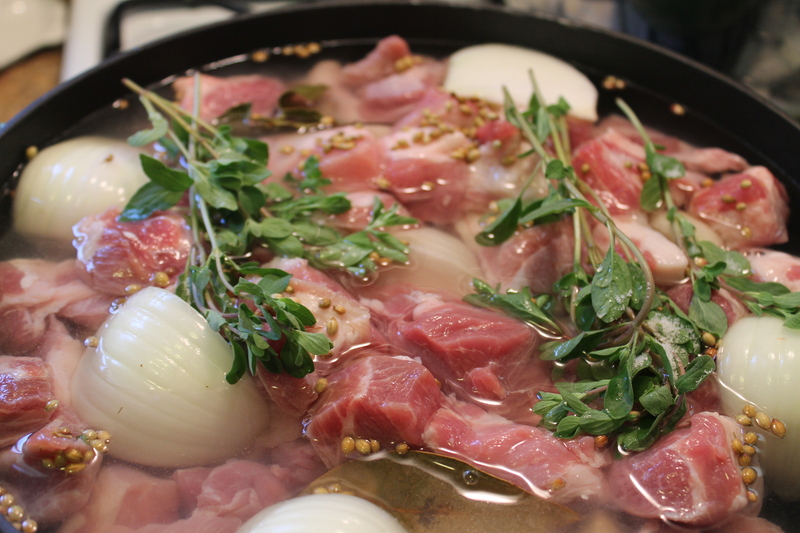 The carnitas will take its own sweet time, thankyouverymuch. 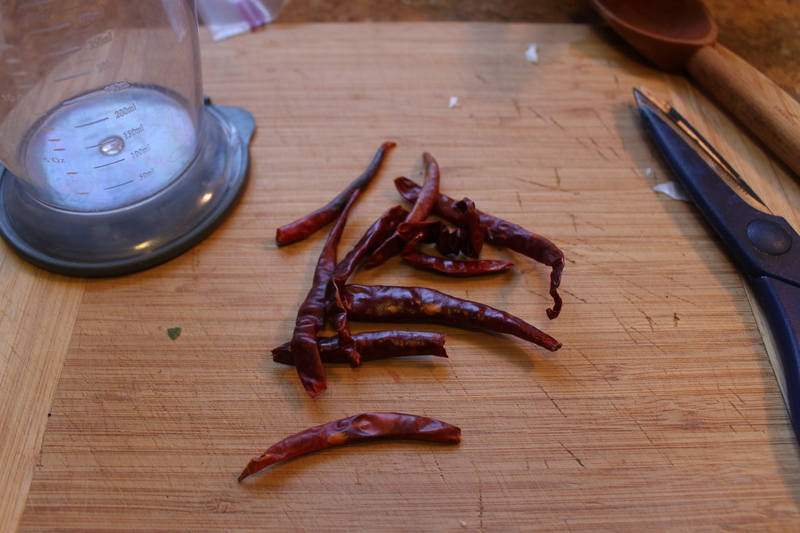 Arbol chiles—necessary for the salsa! Toasting the garlic and tomatillos. Remove and discard the herb packet and onion quarters. Increase the heat to medium high and cook until the remaining water evaporates and just the rendered fat coats the bottom of the pan. Reduce the heat to low and let the meat fry in the fat, turning occasionally, until browned all over, about 20 minutes. Serve the carnitas in tacos, burritos, or tostadas with your desired toppings. In a dry skillet over medium-high heat, toast the chiles until slightly browned. Remove to a blender. 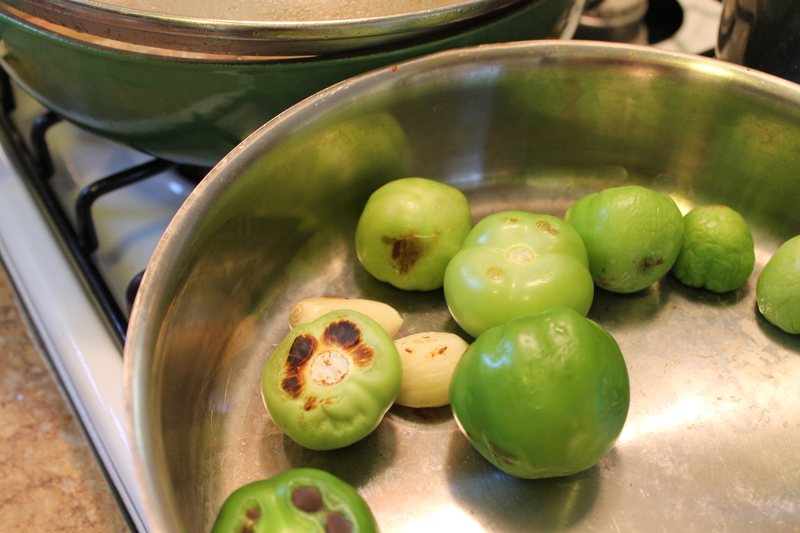 Next, toast the garlic and tomatillos until they have brown spots on them, then put in the blender. Add the cooking liquid and purée; pour back in the skillet and simmer for 10 minutes. Love the time and care it took to bring this dish together, you’re having your own slow food revolution! You KNOW I’m gonna be trying THIS!! And the refried beans that I could refer back to. Always looked for a good refried bean but they always seem to have questionable ingredients…..yours are just real food!! Nice! Ooooh…..that sounds great too….even if you DO have to blow on them! I gotta toast my tomatillos like that! Your title had me nearly snorting green smoothie out my nose. I can’t think of a better compliment—thank you! And I hope a smoothie incident was averted (as funny as it sounds!) !! Especially when you least suspect it…. I need to get a decent kitchen! I want to try this. The boy loves mexican food but says he can’t get anything decent in the UK. You always make me hungry damn it! This shouldn’t take much room–after all, my kitchen is called “tiny” for a reason! I had a bigger kitchen in London! Wow, this looks very tasty! Surprisingly, I have never cooked with pork before. Time to start! I hope you make it! It’s really easy, just needs some babysitting. Enjoy! You are an inspiration! I love Mexican flavours but don’t really cook much in the way of Mexican food; this will change 😉 Fabulous! The recipe sounds terrific…I like the way the meat fries in its own fat at the end. I want a t-shirt that says “You cannot rush the carnitas”. This looks amazing!! I’m dating a pork-lover. I’ll have to bust this out on a special occasion. Like right now. Bust a move, girlfriend! I’m having T-shirts made up now.